Summertime is the most popular season for camping, and with good reason. After all, what better time to be outdoors than during the warmest months of the year? Summer weather allows for countless delightful activities, such as hiking, swimming, fishing, and more. And, with the kids on break from school, the whole family can come together for an incomparable vacation of bonding and fun. Unfortunately, camping in the summer can also make for extreme heat, which is highly uncomfortable, especially when trying to fall asleep in a tent. While camping in a trailer, RV, or motorhome with air conditioning alleviates the inconveniences of sweltering conditions, camping in a tent offers a widely desired, traditional experience. But, these thin enclosures don’t present any protection against intense heat. Being outdoors in very hot weather can lead to heat-related illnesses, which can be severe and even result in death. There are basic precautions which can help you avoid heat-related sickness; wear lightweight, light-colored clothing, opt for a thinner, less insulated sleeping bag, make sure to be well hydrated, and try to set up camp in a shady area. But, even after taking all of these steps, you may still find yourself baking in the summer heat. Protect yourself and your family from the hot summer air, especially older individuals and children under the age of two, by purchasing a tent fan. The use of a fan in your tent will help to bring down the area’s overall temperature, reduce humidity, and increase air circulation. There are several different fan options available today that are great to use in a tent, and many are highly affordable. The many variations of camping fans may seem overwhelming. This article will simplify your search by outlining everything you should know about tent fans, including the different types, brands, products, and general tips that every camper should keep in mind. The Image Portable LED Camping Lantern with Ceiling Fan has made it to the top of this list for its outstanding customer reviews, sweeping range of functionalities, and surprisingly low price. Lovers of this Image original rave about its quietness while running and strong, efficient construction. You have many different options for how to use this 2-in-1 fan and lantern. 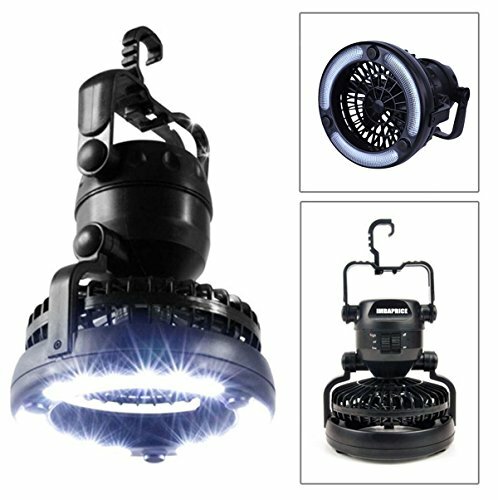 The LED light and small fan can be put together to create a hanging device that sheds light and provides cooling simultaneously. Simply attach the sturdy hook to an appropriate structure, like the top of your tent or a tree branch, and enjoy overhead lighting and cooling. However, the two pieces can also be separated to make a fan that stands up on its own; perfect for the top of a picnic table or right next to your sleeping bag. This design is not exclusive to the Image brand; there are other similar models on the market. But this particular product comes with an unmatched reputation for quality and customer satisfaction. The LED light incorporated in this device is 18 PCS, which is enough to illuminate your tent or to light up your path outside at night. The angle of this light can be adjusted 360 degrees, so you can direct it anywhere you need, like right onto the book you’re reading. The bright LEDs have been positioned in a ring shape to accommodate the fan underneath, and you can easily turn the light on and off with the switch positioned next to the control for the fan. While this product is not solely a fan for tents, it is built to cool down your camping area and make your experience more comfortable. The rolling speed of the fan offers adjustability between two speeds: high and low. The control switch is conveniently located at the base of the device, making it easy to adapt the fan to your changing needs. This device requires 2 D batteries, which are not included. The fan can run for 5 hours on high speed mode, 15 hours in low speed mode, and the light can run for 20 hours. The batteries are to be placed in the top case. The structure is made primarily from sturdy black plastic, and it weighs just over 1 pound, making it highly portable. The fan is 5.7 inches in diameter. 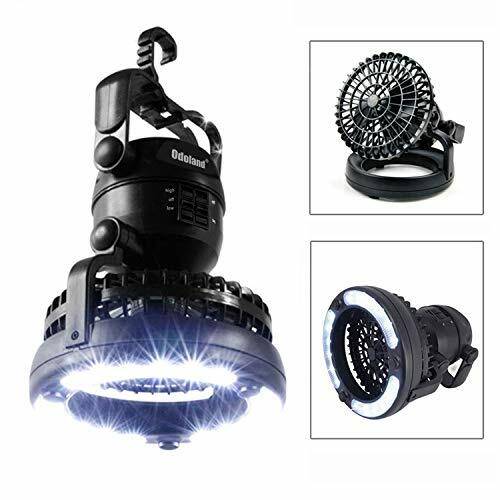 One of the best aspects of this Image 2-in-1 camping device is that it combines a light and a fan into one; you only have to remember one device on your trip to meet two essential needs. The downside to this product is that the fan, while of great quality, is not as high-powered as some other, fan-only devices. But, if you are a camper who appreciates innovation and efficiency, the Image camping lantern and ceiling fan may be perfect for you. The O2COOL 5-Inch Portable Fan is a small but powerful cooling device. This fan is one of the least expensive options around. Despite its low price tag, however, this O2COOL model delivers quality, efficiency, and convenience. This fan for camping includes two speed settings, granting you the power to adjust to the changing weather. The fan is also quiet operating for a peaceful camping space, and the simple standing design tilts so that you can direct airflow to where it is needed. It uses just 2 D-cell batteries, so you do not have to worry about lugging around several replacement batteries on your trip. There is an outlet for an AC adapter for those planning for extended periods of use. The batteries and AC adapter are not included. The battery compartment has been cleverly incorporated into the base of the fan, which is what allows it to stand up. What sets the O2COOL 5-Inch Portable Fan apart from the rest is its outstanding portability. It is a small product, weighing around 13 ounces, but it has also been designed to be foldable. When folded the fan is very compact; you can throw it into any travel bag without it taking up too much space or weighing you down. Plus, when not in use, the folded fan makes storage incredibly simple. This fan is ideal for cooling confined spaces, in which large fans often produce an excess amount of air. The main downfall of this fan from O2COOL is that its modest size limits the number of people that can be cooled down at once. On big family camping trips or other occasions with several people in a small area, this 5-inch fan can’t provide large-scale relief from the heat. However, for cooling down individual sleeping areas, more intimate outdoor gatherings, or if you decide to go on a solo camping trip, the O2COOL 5-Inch Portable Fan could be just the right product for you. The O2COOL 5-Inch Portable Fan comes in both gray and black. 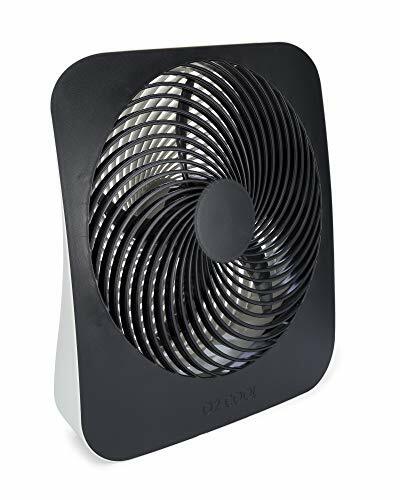 When not used on camping trips, this fan is great for office use, as it can sit comfortably on a desk without taking up too much space or making a lot of noise. It is also small enough to sit on a windowsill, keeping you cool around the house. This versatile product from O2COOL will be a great addition to your day-to-day life, especially in the heat of summer. Designed for those seeking the strength and endurance for extended periods of use, this O2COOL fan comes with an AC adapter. You can also use six D-Cell batteries to power this device, although batteries are not included. This fan has a battery life of up to 40 hours. The option of using an AC adapter eliminates the worry of batteries dying mid-camping trip. Few fans for tents include an AC adapter with purchase, making this deal from O2COOL an exceptional value. The two options of power source for this fan also make it great for a variety of purposes besides camping, including use around the house, at the office, or even during a power outage. The 10-inch blade of this fan offers two different speed levels for easy adjustment. It operates quietly, so you can keep it on throughout the night without disturbance. While this 10-inch model from O2COOL is not as portable as the brand’s smaller, 5-inch option, it includes a built-in handle for easy carrying and travel. Also, it weighs just over two pounds, so it is relatively lightweight. Plus, the larger surface area has the capability to cool down more people at once; it’s a fantastic choice for family trips. The design is streamlined and compact; instead of a bulky stand, the fan is simply wider at the bottom, which makes it stand on its own. This makes it much simpler to store the device, even when space is limited. 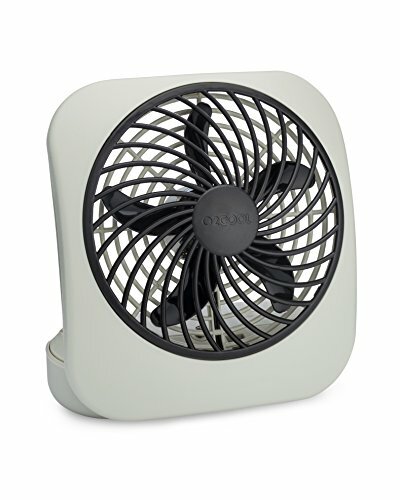 O2COOL has put out several leading camping fans over the years, so the O2COOL 10-inch Portable Fan with AC Adapter is backed by that trusted reputation. Additionally, the blades used in the company’s fans are patented. Built to circulate air efficiently with a small surface area, you will not find the same blade design elsewhere. The O2COOL 10-inch Portable Fan with AC Adapter is an excellent product, but it does have a few downfalls. The fan’s base does not tilt, so you have to move the entire device each time you want to change its direction. This is a small inconvenience but could prove frustrating in some situations. Also, a portion of reviewers have complained that this fan is too large to easily travel with. This is not a universal concern, but for those camping with limited space for equipment, a smaller fan would be a better choice. While there are less expensive tent fans available, this fan is a good price considering its size and strength. Also, as previously mentioned, the price includes an AC Adapter, granting you the convenience of not having to purchase the adapter separately. The F235100 Tent Fan with LED Light is a 2-in-1 camping product from BaseCamp, one of Enerco’s leading brands. This product operates as both a fan and a lantern to make your tent as comfortable as possible. This cleverly designed product is built to hang from the top of your tent, acting as both an overhead light and a ceiling fan. Despite offering two functionalities, this device is very light, weighing just one pound. This allows the product to be hung without pulling down on the ceiling of your tent. The compact setup makes travel, storage, and general use much simpler. You can control both the light and the fan with clearly marked red buttons at the top of the device. This hanging fan is equipped to keep you and your camping mates cool in the summer heat. The fan offers two speed settings to adjust to your needs, and makes little noise as it operates. The blades are constructed of foam, which allows the device to weigh very little. Blades made from more solid materials, such as plastic, tend to produce a stronger result. However, this fan comes from a manufacturer with a reputation for quality and efficiency, so you can trust it to get the job done. 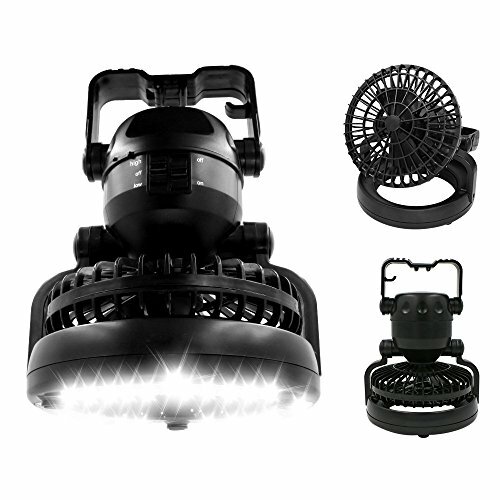 A powerful white LED light, rated at 50 Lumens, is positioned in the center of the fan. Basecamp has incorporated cutting-edge bulb and reflector technology to create an outstanding in-tent light source. The light offers three different settings so you can adjust it according to the time of day or the amount of light you need, whether you are reading a book or taking a photo. One of the best features of this device is its energy efficiency. It requires four D-batteries, which are not included. It has a runtime of up to 48 hours on the low setting and up to 24 hours on the high setting. Considering its size and battery requirement, this product has an excellent battery life. One downside of the F235100 Tent Fan with LED Light is that it does not offer the option to use an AC adapter as an alternative to the batteries. This does not pose a problem for everyone, as a battery-powered device is ideal for most camping sites anyway. But for those seeking a product that can be in use for extended periods of time while connected to electricity, the F235100 may not be the right fit. This is a higher price than some of the other options on this list. But, considering the quality of both the LED light and the fan, the price range of the F235100 is reasonable. The Haitral 2-in-1 Portable LED Camping Lantern with Ceiling Fan is another great camping device that combines the two essential tools of a light and fan. The product is trusted to deliver on quality and efficiency, providing convenience to campers of all kinds. This device can even be used for other outdoor activities like fishing or hiking, and during electricity outages or other emergencies. This Haitral camping product is designed to hang from the top of your tent, providing overhead air circulation and light. It is hung by a sturdy hook, which can be used in all sorts of locations. However, the fan can also be removed from the hanging structure and stands on its own for when you want a more direct cooling experience. The 5.7-inch circular fan offers an adjustable rolling speed; two different modes grant you control over the fan’s power level. You can change between the high/low fan modes by using the clearly labeled switch at the base of the device. This highly rated product from Haitral includes an LED light that is 18 PCS bright. The bulb has a lifespan of 1,000,000 hours, and is powerful enough for use outdoors as well as in a tent. The LEDs are positioned in a ring shape, leaving the center open for the fan so the two can operate simultaneously. This LED light can be adjusted 360 degrees to achieve any lighting angle you desire and is controlled by a simple switch located next to the fan switch. The Haitral 2-in-1 camping lantern and fan is powered by two D-cell batteries which are not included with the purchase. The LED light can run for up to 37 hours. The fan is able to operate for 50 hours on low speed or 30 hours on high speed from a single set of batteries. 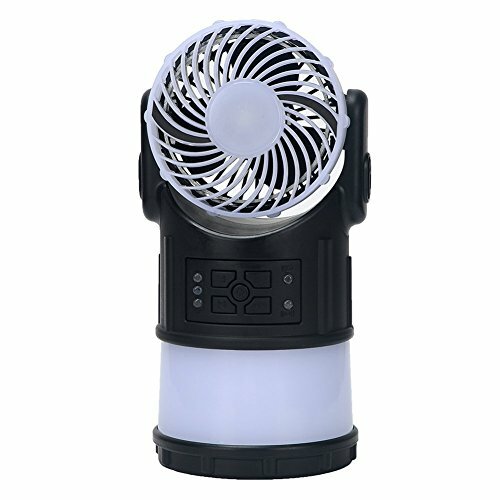 You can use the light and the fan simultaneously for up to 16 hours without having to change the batteries (this number applies to the fan on low speed.) The batteries are conveniently installed in the top case of the device for an efficient, streamlined design. This camping tool is highly portable and light, weighing just over one pound. Thus, a tent can easily support its weight, and carrying it along on your trip will be no trouble at all. As a well-rounded device, this product doesn’t have many obvious drawbacks. However, for those only seeking a fan, and who do not need a light, this product would not be ideal; there are other options which would solely provide a high-powered fan. This is a great price, not only when compared to competitors in the field, but also for the breadth of excellent features it provides. Additionally, it comes with a 90-day warranty, and a 30-day money back or replacement guarantee. Typically, fans for tents are simple devices; some are identical to an everyday house fan. 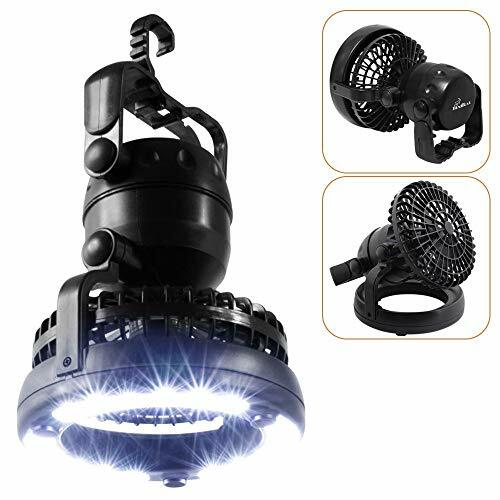 But, knowing the best, most efficient way to use this fan will exponentially raise your comfort level, improving the overall quality of your camping trip. The placement of your fan will make all the difference as it cools your camping area. Always set up the fan an ample distance away from the sides of the tent. This way, the walls won’t block airflow and the fan will be surrounded﻿ by open air that it ﻿c﻿an circulate. Circulation is key for fans because it helps to disperse humidity, which makes hot weather even more uncomfortable. Due to the fact that fans can reduce moisture in the air, these devices can also be helpful in wet, rainy weather to dry out your tent. If you do use your fan after a rainstorm, make sure that the device doesn’t come into direct contact with any water to avoid damage to the fan or electrocution. Staying cool during the night can pose a serious problem while camping. Sleeping bags are often too hot, but being uncovered during the night exposes you to bugs. Wear bug spray or lotion to avoid getting bitten, and wear lightweight clothing that will keep you covered. Position the fan to face your sleeping area before you go to sleep and during the night. There is no quick fix to endure hot weather, but taking these small steps will make the heat more bearable. Most fans for camping are battery powered because not all camping sites offer access to electricity. Some products offer you the option to attach an extension cord. This is preferable for some because it allows you to use the fan for extended periods of time without having to worry about the battery dying. If you choose to use an extension cord, make sure that it is sturdy enough for outdoor use. If you plan on relying solely on battery power, bring a pack of replacement batteries to ensure that your fan will work throughout the entire trip. Camping fans come in many different sizes. Some are large enough to cool down multiple people at once, while others only provide a breeze for one person. Make sure that the fan you choose is appropriate for the size of your camping party. Many fans include multiple speed settings. This is a great feature; you can use the highest setting during the day when the sunlight is very hot, and the lower, quieter setting as you sleep. Keep in mind that the higher setting will burn more power than the lower setting. So, your batteries will last longer when the fan is set on a lower setting. In extreme heat, the air from a fan may not be cool enough on its own. You can set a plate of ice in front of your fan to bring down the temperature of the air that is circulating. To do this you must remember to bring along extra ice in your cooler. Fans for tents come in multiple unique variations, with different models catering to different needs. The best product for you depends on where you will be camping, the length of your camping trip, and many other factors. Below are the main types of products that you will find amongst today’s leading tent fans. ​Most fans used in tents are set up in one of two ways: either hung from the top of the tent with a hook or loop or simply set onto a surface so the device stands on its own. Hanging fans create the effect of a ceiling fan. With air being circulated from overhead, the cool air reaches a wider area than most standing fans are able to. For large open tents which shelter several people, a hanging fan may be the best choice. Some hanging fans come with LED lights included, which is highly convenient in many situations. The main concern with this type of fan is whether or not it will stay in place. Most camping tents are made out of thin materials like nylon or canvas--a heavy fan could easily pull down the enclosure. And, in windy conditions, the fan could fall and become damaged. Luckily, there are lightweight, durable hanging fans available which, when secured properly onto a tent rod, can be trusted to stay put. Just make sure to monitor the weather and take the fan down if rain or wind cause the tent to sway significantly. Standing fans are simpler in design than their hanging counterparts. With some form of wide base or stand, you can place this kind of fan wherever fresh air is needed, whether that be atop a table, on the floor of your tent, or on any other flat surface. With a standing fan, all you have to do is put it down and turn it on--a much easier installation process than that of hanging fans. Also, when you get home from camping, you can use this type of fan anywhere around the house. The main drawback of standing fans is that they typically can only circulate air in one direction. This means that it can cool down a small area quickly and directly, but it may take longer to circulate cool air throughout an entire tent. Use a standing fan to cool yourself off before bed, after a hike, or any time you need fast heat relief. Fans used in tents typically get power through batteries or an AC adapter, and some models offer the user a choice between the two. Battery powered fans are the most commonly used among campers, as batteries eliminate the need for an electrical socket. Not all camping sites offer access to electricity, and those that do often require a specific fitting that may not work with the extension cord you already own. Battery powered fans are very portable and can be placed anywhere--you don’t have to worry about cord length. Fans vary in the number of batteries they require. The more batteries used by the fan, the longer its run time will be; larger fans tend to call for a higher number of batteries. Also, the batteries will last longer when the fan is running on a slow speed setting and will die faster on a high setting. Most battery powered fans can run for several hours on a single set of batteries. But, for long camping trips, bring along some replacement batteries just in case. For those planning to use a fan for extended periods of time and do not want to worry about changing batteries, an AC adapter may be the best power source option. When connected to a fan, an AC adapter can power the device using electricity from a main’s power supply. So, you don’t have to worry about batteries dying out; you will be able to run your fan on any speed setting for as much time as you need, so long as it is connected to electricity. Before you settle on this form of power, make sure that your campsite has access to electricity. Then, when setting up your tent, ensure that the fan can be placed an appropriate distance from the electrical outlet so that the cord will reach far enough. Some fans for camping include an AC adapter with purchase. Others have the outlet for an adapter but do not include the adapter itself. In this case, make sure that you have, or will be able to find, a compatible adapter. There are numerous brands to choose from when buying a fan for your camping trip. Finding a reliable company is important before investing your money in a product. Below are summaries of some of the leading manufacturers of tent fans around today so you can learn more about who you’re buying from. O2COOL designs, manufactures, and markets products in the realms of cooling, hydration, pet, patio, pool and beach. Linda M. Usher established the company in 1992, and since then O2COOL has become a prominent name in the portable cooling industry with its top-selling misting fans, battery-powered fans, and drinking bottles. This brand maintains its position as a leader in the field by working to develop innovative new products, having put out many patented cooling devices over the years. Additionally, O2COOL has cemented their authority as a brand by becoming a member of the American Pet Products Association (APPA) and the International Housewares Association (IHA). O2COOL operates with an expansive code of ethics, so you can feel good about using their wide array of products. From worker rights and protections to environmental standards, this company is dedicated to fair, honest principles. You can find O2COOL products at an assortment of retail locations across the country, online, and in select locations internationally. 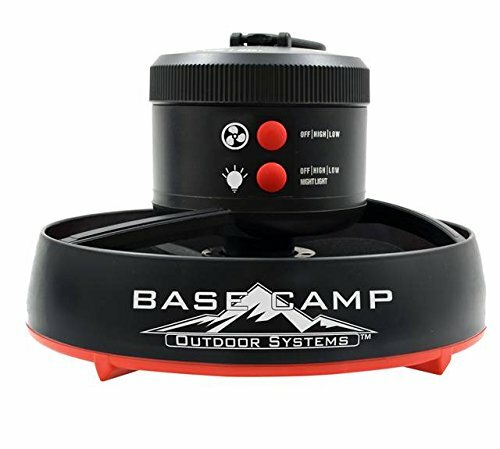 BaseCamp is a brand by Enerco, a top tier company which specializes in infrared combustion. Through its many brands, including Mr. Heater and Heatstar, Enerco manufactures a wide variety of products for use outdoors, at home, around job sites, and for sports. The company has been around since 1955 and has continually put out some of the most advanced, consumer-friendly technology in the industry. From their revolutionary quiet burner technology to the first cordless forced air heater, Enerco products offer the highest level of innovation around. The BaseCamp brand is inspired by basecamps across the globe which supply people with the tools they need to embark on any adventure, no matter how extreme the conditions. The brand covers a range of camping supplies to meet all of your outdoor demands, including portable showers, LED headlamps, stoves, furniture, refrigerators, reusable fire starters, and fans. No matter your needs, BaseCamp promises durability, quality, and the highest level of technology available. 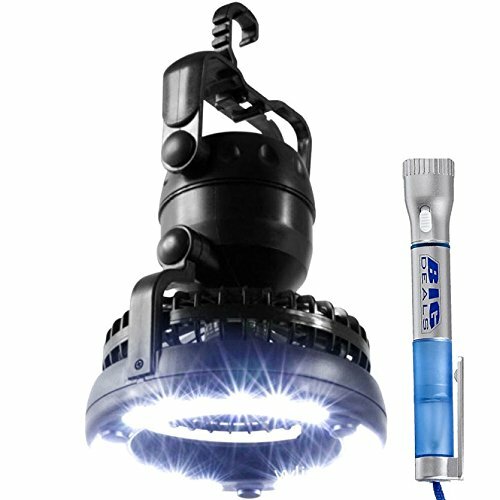 Haitral is a manufacturer of top level LED lighting, and has made it onto this list for their 2-in-1 camping fan and LED light product. From basic indoor lighting like table and floor lamps to solar landscape lights, Haitral covers a sweeping assortment of lighting needs. Haitral is committed to providing the best possible service and value to their customers. With experienced customer service representatives available to address questions and provide individualized advice, Haitral makes sure that all of your needs are taken care of. Additionally, if you are disappointed with your purchased Haitral product, you can return it for a full refund, guaranteed. While this manufacturer specializes in LED lighting, their product lines reach into other areas, providing quality and affordability for a variety of consumer needs. Honeywell’s origins date back to 1885, its history involving the merging of multiple companies and the innovative ideas of many revolutionary individuals. Named after engineer Mark Honeywell, this brand has pushed the limits of technology to streamline everyday life and solve pressing issues throughout the years. Honeywell’s invention of the electronic autopilot in 1942 was critical to America’s role in World War II; Honeywell is the brand behind the iconic “Round” thermostat in the 1950s; the brand is the global leader in the alarm and fire detection system market. This is just a selection of Honeywell’s many influential breakthroughs and inventions, which span several decades and different industries. Today Honeywell continues to lead the pack in a range of industries: home, industrial buildings, aerospace and defense, oil and gas, personal safety, security and fire, manufacturing, vehicles, scanning and mobile productivity, footwear, healthcare and medical, chemicals, specialty materials and fertilizers. This brand maintains a strong global influence by conducting business out of 1,250 sites in 70 countries worldwide. Additionally, Honeywell has been recognized with several industry awards through the years; this year in 2016 the company was chosen as one of Fortune World’s Most Admired Companies, just to name one. When you shop Honeywell products, you are buying from a long-standing, highly successful brand with decades of experience--and you can expect excellence. The outdoors are a fantastic place to enjoy new activities, take a much-needed vacation, and make memories with friends and family. Camping allows you to make nature your temporary home for an experience unlike any other. All the same, spending long stretches of time outside comes with several challenges, one of which being the discomfort of extreme heat. A camping fan is the most common solution to this issue, with an array of different makes and models currently available for purchase. Whether you need something compact for individual use or a large, powerful device for the entire family, there are multiple options listed above that can effectively meet, and even exceed, your needs. So go on, plan that camping trip during the height of summer heat. Using the information above, you can bring along the perfect fan to survive the hot summer sun and have a wonderful time with your loved ones.